A journey into the mysteries of water – with inspiring images – covering great environmental issues, nature mysteries, and research at the boundaries of science. We see how plants and pristine rivers shape the environment of each other, and reflect on the climate. We meet water surfaces forming impressionist paintings, the Rhine Gold, research on healing and water, energy from cold fusion, and much more. 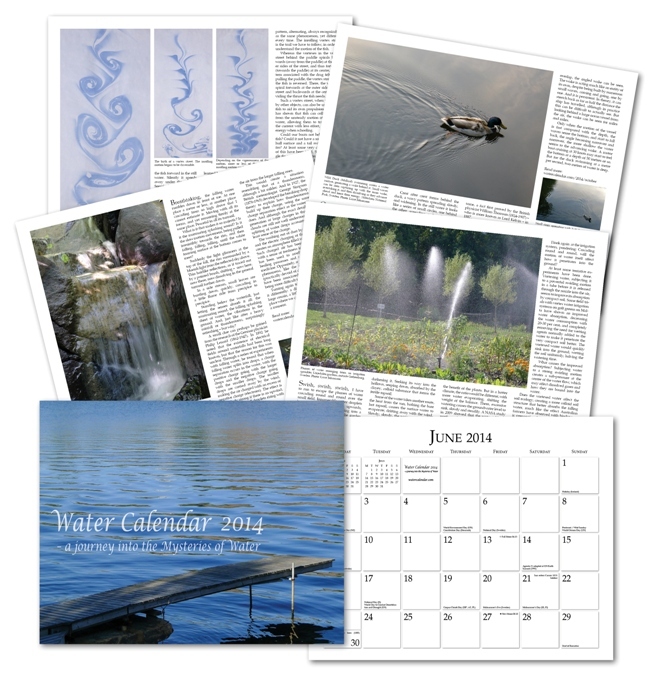 Water Calendar 2014 – a journey into the Mysteries of Water, is a beautiful (30x24cm) wall calendar, containing texts and images from the watercalendar.com essays of 2014. The calendar includes various dates associated with water (e.g. UN recognized days), public holidays of several countries (including those of Sweden, Norway, Denmark, Finland, Iceland, United Kingdom, Ireland, Germany, Netherlands, Belgium, France, United States, Canada, Australia, New Zealand and South Africa) and more. Price: SEK 109 (approx. 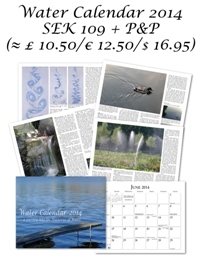 £ 10.50 / $ 16.95 / € 12.50) + P&P. 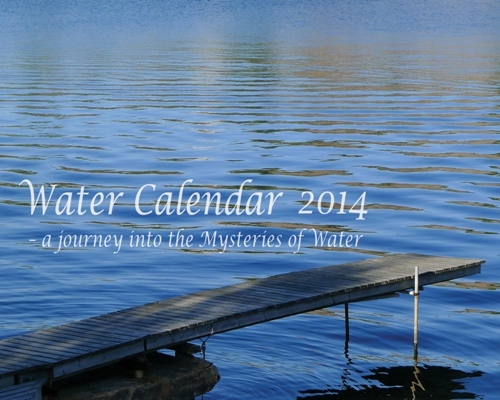 With the mind of a scientist and the heart of a poet, we continue the journey into the mysteries of water. A journey with stunning images, and essays on alternative research – on water and the environment. In the 2014 calendar, we will meet Viktor Schauberger’s perspective on untouched rivers, and perhaps see the Rhine gold glimmer in the depths. We will meet rainforests maintaining their own climate, and reflect on how water and life defines the climate of the planet. We will see water surfaces forming impressionist paintings, observe the wake of a duck, and learn from a trout swimming elegantly. We will hear about raindrops forming thunder, about vortexes improving land use, and reflect on how we use water on the planet. Looking for new perspectives, we will see if water responds to healing, or to a magnet, and examine the controversy of cold fusion energy from water. As a new month begins, a new page opens for the month at watercalendar.com, and by following the month’s link in the calendar you will find additional information and links related to the text. Environmental scientist Lasse Johansson has created a wall calendar with an engaging series of essays on our relation to water, and with inspiring images. Lasse Johansson is an engineer and active at the Institute of Ecological Technology. He has been involved in the design of water channels with self-organizing flow (which were awarded Excellent Swedish Design Award in 2001) in the environmental city district Augustenborg in Malmö, and has organized several international scientific conferences on alternative perspectives on water. Photos & illustrations by Lasse Johansson, Dag Birkeland, Nigel Wells, Lennart Lidfors, Olof Alexandersson.